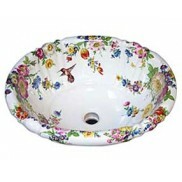 Customize your bath or powder room with one of our beautiful and unique hand-painted bathroom sinks and toilets. Every one of our sinks and toilets is a work of art, made by hand in the USA using the age-old traditions of ceramic and porcelain decoration. 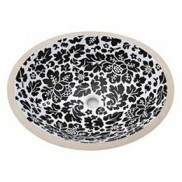 We have designs to suit every taste and bathroom decor from traditional to ultra contemporary. All of our sinks and toilets are kiln-fired to temperatures around 1500 degrees Fahrenheit so the design is permanently fused with the porcelain and will not fade out or wear away with proper care. 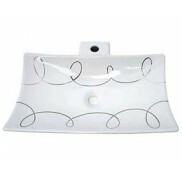 Most of our designs are available on a choice of fixtures. If you don’t see what you are looking for, visit the Fixture Choices page for options or call or email us for more information. Bright red Anthurium flowers painted with yellow centers and dark green leaves arranged to create a ..
Are you doing a rustic bathroom or redoing the powder room in a fishing cabin, cottage, lake house o..
Customize your guest bath or powder room with this colorful design painted on the sink. 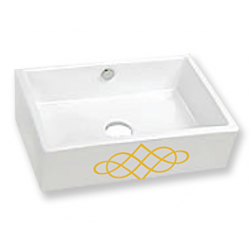 The exo..
Customize your guest bath or powder room with this colorful vessel sink. Our Bird of Paradise design.. The Blue Amaranth Medallion is similar to the Blue Amaranth but the roses, flowers and leaves are&nb.. Inspired by Delft china, these blue and white designs work great in any bathroom interior from .. Whether it's Wedgwood, Blue Willow or Blue Delft, the Blue Amaranth will fit right in. Our blue and ..
Blue and yellow Iris flowers with green leaves are painted to create a geometric border near the top..